See Marcus and JD in duck and cover chaos. 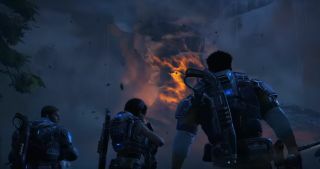 Ahead of its October 11 release, the latest in-game campaign footage showcases a typical mix of pensive exploration and speaker-busting action combat, not to mention a fierce storm towards the trailer’s end. The star of the show this time round is JD—the son of past protagonist Marcus Fenix—however the segment above confirms that his father, now noticeably older, joins in the action along the way. Gears of War 4 is due to launch October 11 as one of Xbox One’s cross-platform Play Anywhere games.